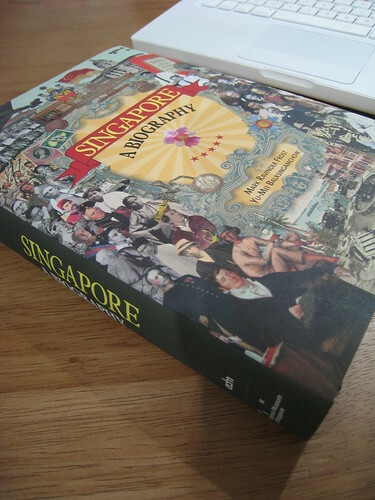 Singapore: A Biography has won a Gold Prize at the Asia Pacific Publishers Association Book Awards 2010. Woo! I wish I could ferret out more info on these awards, but all I know is that the prize is in the category of general books and the Association is based in Korea. Also, it does not seem to come with a gold statue that I can put on my (nonexistent) mantel. But still: chuffed! Thank you to National Museum director Lee Chor Lin and her curators (past and present), and great job by our tireless editor Ibrahim Tahir, book designer Annie Teo, marketing folks Antoine Monod and New Bee Yong, and everyone at Editions Didier Millet. And of course, my co-author Mark, who was the first one to dream big about what this book could be. I think I shall go celebrate with ice cream. Congrats Yu-Mei! That book deserves some accolades! Have you applied the Cringe Test today?